The state Congress leaders have divided most of the Punjab Pradesh Congress Committee delegate seats among themselves in an “election” that is likely to be completed by tomorrow even as there are widespread reports of lack of consistency in the entire process. The ISI spy, Nizam Baksh, who was nabbed by the police, is craving to meet his mother. He reportedly expressed his delight after the police initiated proceeding to send his case to the External Affair Ministry. Having triggered a crusade against menace of female foeticide in the state, Bathinda MP Harsimrat Kaur Badal is all set to open a new front to eliminate the spectre of drug addiction that has reportedly gripped more than 65 pc youth of the state. 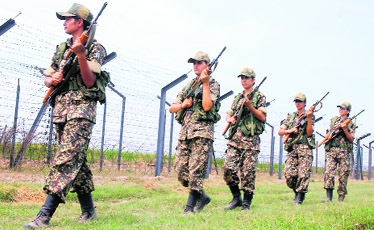 A year after the first women battalion of the BSF was deployed along the Indo-Pak international border, the women constables not only augmented the security of the border but also have been of immense help in checking narcotics-related crimes and frisking of women folk going ahead of the fencing gates. First batch of BSF women constables patrols the Indo-Pak border near Attari. Overexploitation of ground water to meet irrigation needs has in recent years created a big problem of water shortage in Punjab. While opposing the plea made to the Gurdwara Election Commission by some of the small political parties for revising the schedule for the SGPC elections, SGPC president Avtar Singh Makkar said today that electorates had not obliged these “seasonal leaders” during the process of revision of electoral rolls, thus they would not be in a position to win even a single seat. After rejecting many names, Gujarat Chief Minister Narendra Modi okayed the name of Balbir Punj to make him in charge of the party affairs in Gujarat three days ago. Punj has been shifted from Punjab to Gujarat. Owing to tough stance taken by Punj on many issues, including refund of power bills and transfer of certain share from VAT to the municipal committees, the SAD leadership in Punjab was not happy with him. A meeting of the Sikh Intelligentsia Forum was held under the leadership of its president Dr Kulbir Singh Dhillon here today. After initial hiccups over allotment of a site at Knowledge City in Sector 81, work on Mohali campus of Indian School of Business (ISB), Hyderabad, has begun. “After hoping to complete the new campus by next year, the business school plans to start classes in specialised postgraduate programmes by April 2012,” said Kavita Mahajan, chief executive of the ISB. Two brothers — Kashmir Singh and Balbir Singh of Kaluwada village — drowned in the Sutlej near Tindiwala village along the Indo-Pak border under mysterious circumstances late last evening. The divers who risk their lives to save others whenever any mishap takes place in the Bhakra Canal in Fatehgarh Sahib and its adjoining areas rue government apathy towards their own plight. Potable water has become the primary concern in villages throughout this district. According to a survey carried out by the Water Supply and Sanitation Department, water in over 100 villages of the district is unfit for drinking. This survey was carried out almost an year ago. The report was submitted around two months back that read that the water has a very high content of fluoride which makes the water unfit for drinking. Inhabitants of Majithia Enclave here are in a fix over the casual approach of the Water Supply and Sewarage Board in laying down sewarage in the area. The water treatment plant of Punjabi University here has been non-functional for a long time due to some technical snag. As a result, potable water is being used for the maintenance of the lawns and upkeep of the playgrounds. Rajpura, July 24 Parkash Singh, a farmer of Pabri village, fell unconscious while spraying pesticides in his fields today. The State of Punjab’s action of withdrawing the benefit of ad hoc promotion to nine cops has failed to find favour with the Punjab and Haryana High Court. Allowing a petition by Dilbag Singh and others, Justice Ajai Lamba quashed the impugned order after holding it to be “unreasonable and arbitrary”. Justice Lamba added that the order was “in violation of principles of natural justice”, as it was passed “without giving an opportunity of hearing to the petitioners”. Showing no remorse, a youth who had carried out the honour killing of his teenaged sister, has confessed to his crime. He told the police yesterday that he had murdered his sister to save family honour. A resident of Ludhiana was drugged and then looted by some unidentified persons at Rajpura yesterday. Later, the victim was thrown away by the roadside. The state Congress leaders have divided most of the Punjab Pradesh Congress Committee (PPCC) delegate seats among themselves in an “election” that is likely to be completed by tomorrow even as there are widespread reports of lack of consistency in the entire process. The organisation elections did not take off with leaders refusing to settle for a genuine election and insisting on dividing the 234 delegate seats on offer through a set formula. When this formula could not be finalised here, the entire state leadership trooped to Delhi where a system was advocated by the Central leadership. Besides dividing delegates, it was proposed to give proportionate representation to women, Scheduled Castes and Backward Castes. Following this, the last two days have seen frantic activity with pradesh returning officer Usha Thakkar meeting senior leaders to finalise the list of delegates. Thakkar is expected to go to Delhi tomorrow to submit the same to the High Command. However, state party members are claiming that the method of dividing the spoils lacks consistency. There are claims that some legislators have been authorised to name two delegates while others have been told to nominate only one. Lok Sabha members have been authorised to name two delegates while former legislators will automatically be taken in as delegates of the PPCC. While the senior leadership is apparently happy with the system, some leaders have demanded that elections be held in their areas. Party general secretary Rampal has made such requests from Mansa and former legislator Arvind Khanna from Sangrur. There is a complaint from Amritsar that a young leader responsible for an enrolment of nearly three lakh has not been considered for nomination as a delegate. Party leaders claim that the failure of the party to conduct elections at the block and district level and the insistence to go in for nomination might be beneficial to the legislators but would harm the party as meritorious candidates would be ignored. There is also resentment that all sections have not been given due weightage. Senior leader Ashwani Sekhri said due representation was being given to workers who had helped in the record 32-lakh recruitment. He was confident that the election process would be over by Tuesday following which a meeting of the PPCC would be convened to authorise party president Sonia Gandhi to nominate the next PPCC chief. “Finally my mother will know that I am alive,” he said. The city police is all set to send a dossier of the Pakistan spy to the External Affair Ministry so that they can inform the Pakistan government that their national was caught for spying. It is learnt that the Pakistan intelligence agencies disconnected the landline telephone connection installed at the house of Nizam Baksh during the time of his training in Pakistan. He told the police that he called his friend in Multan and told them about his whereabouts while he was in Jalandhar, but the Indian intelligence agencies got a tip-off and started looking for him. Ever since he did not contact anyone and was living life like a wanderer. According to intelligence agencies, his obsession for lottery and boozing habit proved to be an undoing for Nizam. His handlers were reportedly annoyed with his drinking habits. He used to visit the Clock Tower daily to play lottery and from there the police got to know about his activities. Like any other lottery addict, he also wanted to get rich overnight so that he could return home and lead a prosperous life. He stayed in Adarsh Nagar Colony in Shimlapuri, which had a huge chunk of people who shifted to Ludhiana from Multan after partition. As a result he easily mingled with the crowd. According to Harsimrat, more than 2,000 unborn girls were being killed daily in India through illegal abortions. This is the estimate of the UN authorities. But, in reality the figures could be much more than that as there is no proper system to keep a track of such killings. The problem is alarming in the northern states, particularly in Punjab, Harsimrat said, adding that only economic empowerment of women could put an end to wide-prevailing bias against the girl child in Indian society. “I have tried to trace the genesis of the problem by travelling from village to village interacting with people. Women confide that despite prevailing perception of ongoing women liberalisation process, they were still dependent on men. People in the rural areas still see birth of a girl child as a threat to economy of their families. The women can be made self-reliant by providing them with more employment opportunities through multi-craft centres where they can be trained in fields ranging from tailoring to operating computers,” Harsimrat said. Last year on July 25 the Union Home Minister took salute of the first batch of the women battalion of the BSF at the Subsidiary Training Centre, Kharkan, Hoshiarpur, under the BSF Punjab Frontier. The BSF authorities feel that with the introduction of vigilant mahila constables, gate management along the border has become more organised while a sense of security prevails among border women. DIG (Intelligence) Pankaj Goomer said last year vigilant women constables apprehended a Pakistan Ranger in broad daylight. “On November 7, 2009, at the AOR of 30 Battalion of the BSF an operation party consisting women constables apprehended a Sepoy, Ali Abbas, of 7 Wing Pak Rangers, Pakistan, at Border Out Post (BOP) Bissno Ke. The women constables observed that the Pak Ranger was trying to negotiate the fence and informed the zero line patrolling party,” he added. BSF officials also said within a year there had been a gradual decline in the number of anti-national activities on the border. “The mahila constables deployed on the Border Out Posts (BOP) have been of a big help in checking narcotics-related crimes as women are increasingly being used as conduits in trans-border narcotics smuggling. The fear among border women of being frisked by women constables has borne good results for the BSF,” they added. Earlier, women folk used to face problems in going ahead of the security fenceas frisking by other border village women was much to their annoyance. “However now the border women feel comfortable in going across the fence for cultivation of their fields as women constables remain present at the border for their safeguard,” said DIG Goomer. Overexploitation of ground water to meet irrigation needs has in recent years created a big problem of water shortage in Punjab. Unfortunately, rain water harvesting and recharging of ground water, which are the need of the hour, are virtually not in use in the state. But, some farmers of Ghal Kalan village in Moga district have developed an innovating technique to pull out extra water from the waterlogged fields through electric tubewells without consuming power. They do this with the help of natural gravitational force and atmospheric pressure. The technique is very simple. The farmers attach a 10-12 metre pipe with the main pipe of the tubewell and put in the water-logged paddy field by digging a small pit under it. Then by holding it in the water, the electric motor is switched on and as soon as water starts coming out of the pipe the motor is switched off. The water gushing out of the pipe stops and the atmospheric pressure forces the outside water into the pipe in a sudden reverse action and then the gravitational force keeps the system working in continuity sending the water under the ground through the bore well pipe. The water starts going down the ground at almost an equal speed by which it comes out. When the system starts working, the farmers place a basket made of wooden twigs under the pipe dipped in the flood water from where it gushes into the pipe. Another farmer Guljar Singh said he had saved his paddy crop that got completely submerged with the help of this technique within two days. “Water level in my fields has now come down from four feet to half feet without any damage to the crop”, he said. In the dark zones, pumps have gone down to a depth of 450 feet. Rain water can recharge groundwater only up to 80-90 feet. So, the pumps extracting water from a depth of 300-400 feet are drawing water from reserves that are irreplaceable. 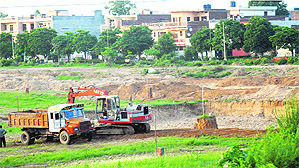 Nihal Singh Wala subdivision in Moga district is worst affected at an exploitation rate of 400 per cent. Number of tubewells have increased from 1.2 lakh in 1970s to 13 lakh in 2010. Groundwater decline has reached 50 to 100 cm per annum. During 1993 to 2003, the average fall in water table was 2 feet per year. Out of 70 blocks water table in 40 blocks have gone down below 50 feet. The worst affected districts are Sangrur and Moga where the water table is below 50 feet. Interacting with mediapersons during a reception organised on his first official visit by Harminder Singh, former convener of the Spinfed Employees Union in Model Town here, Makkar slammed SGPC former general secretary Manjit Singh Calcutta for challenging the voter enlistment form and asserted that the same had been published in 2004 under the guidance of Calcutta. On being asked about delay in releasing list of SAD candidates for the SGPC elections, Makkar said it was prerogative of Chief Minister Parkash Singh Badal who was still assessing the credentials of the perspective candidates. Refuting the allegations that voters had not been enrolled in Haryana, the SGPC president claimed that during his recent visit to Yamunanagar and Panipat he found that electorates were equally enthusiastic and the process had been going on well. On formation of the Rajasthan Sikh Gurdwara Prabandhak Committee, Makkar said the SGPC had been constituted to manage gurdwaras in undivided Punjab only. The province was divided by creation of Pakistan and later Haryana too came up out of it. Delhi and Rajasthan were not in its ambit. If some persons had formed a committee in Rajasthan, we have nothing to do with them. Party sources said BJP president Nitin Gadkari had to delay the announcement for about two weeks with regard to the appointment of in charges of party affairs in different states because of Modi, who had rejected two lists - each carrying three names - sent to him to select a leader of his choice for appointment as in charge of party affairs in his state. As Gujarat is politically and ideologically important state for the BJP, the name of the in charge of the party affairs was also to be approved by RSS chief Mohan Bhagwat and LK Advani, who belongs to Gujarat, Nitin Gadkari besides, Modi. Only three days ago, Modi approved the name of Punj, who had defended the Gujarat Chief Minister at the media and other platforms in the past when some other senior leaders had backed out to do so. Professor of Religious Studies, Punjabi University, Patiala, Dr Harpal Singh Pannu said it was felt that it would be better if the Delhi Sikh Gurdwara Management Committee (DSGMC) kept its syllabus up to the affairs of Delhi gurdwaras only. The forum appealed to Punjab Chief Minister Parkash Singh Badal to meet Prime Minister Manmohan Singh and request him to instruct Sarna brothers to refrain from issuing baseless statements that might plunge Punjab into a turmoil. Professors who attended the meeting included Dr Parmajit Singh Goraya, Dr Rajbans Singh Gill, Dr HS Bhatti, Dr Daljit Singh, Dr Balraj Singh, Dr Nishan Singh, Dr Jashandip Singh, Dr Jasbir Singh, Dr Balbir Singh, Dr Dalbir Singh Randhawa and Principal Parminder Singh Bawa. After initial hiccups over allotment of a site at Knowledge City in Sector 81, work on Mohali campus of Indian School of Business (ISB), Hyderabad, has begun. “After hoping to complete the new campus by next year, the business school plans to start classes in specialised postgraduate programmes by April 2012,” said Kavita Mahajan, chief executive of the ISB. In city to monitor the work on Mohali campus, the ISB’s chief executive said in the first batch, 200 students would be enrolled in four specialised postgraduate programmes in healthcare management, public policy, manufacturing and operation excellence and physical infrastructure management. For offering specialised subjects, the business house was coordinating with various academic institutions to chalk out syllabi. She said the campus would give a boost to economic development in the area, be it education, hospitality, entertainment and other related infrastructure. The Punjab government on a 99-year lease at Rs 1 per acre has allotted the ISB campus site annually. The complete expense for setting up the campus amounts to Rs 300 crore. Surprisingly, neither the civil nor police authorities knew about this mishap till today noon. The deceased were cremated without informing the police. Even postmortem examination was not conducted. Deputy Commissioner KK Yadav said he was not aware of such an incident, but would inquire into the matter. Kashmir and Balbir, who were supposed to go to Kaluwada on a boat along with other family members after attending a social function in Ferozepur, went into the Sutlej one by one and never came out. The bodies were found today. Though the residents of Kaluwada, Tindiwala and Chandiwala villages tried to locate the duo after they came to know about the incident, they could not succeed in their efforts. According to the residents of Tindiwala, Kashmir jumped into the river and when he started drowning, Balbir also jumped in to save him. Though both brothers knew swimming, they could not come out. The family members of the deceased raised an alarm but they could not be located due to strong water currents. Rup Singh, a social activist of the area, said Kashmir and Balbir were trapped in the mud about 25 deep into the river and hence, could not save themselves. He added that in absence of proper mechanised boats, the residents of these border villages had to use traditional boats to travel from the one bank to the other. “While no one dares to even touch the gushing water, we enter deep into the canal to save people, fish out dead bodies and even take out vehicles from the water,” said 32-year-old Sikandar, a diver for the past 16 years. The police roped in Sikandar, along with four others, to fish out car of three youngsters who met with an accident near the floating restaurant in Sirhind last week. Besides extending help in taking out the car, they also fished out bodies of two boys. “Sometimes we have to travel alongside the rivers for more than 200 km in search of the missing people. Bodies appear on the water surface only after two or three days of drowning and we have keep looking for them even during night hours,” said diver Ghogha from Doraha. He said they had a team of five divers active in Fatehgarh Sahib and Khanna areas. Sometimes, they even had to counsel people who made suicide bids in the canal, he added. “Taking out dead bodies did not bring any financial gains to us, but we fail to resist ourselves whenever relatives of missing people plead before us. We have seen people occupying very high positions literally pleading before us and touching our feet during such tragedies,” said another diver, Naresh. “Devotees throw coins into the water and by collecting these coins, we earn Rs 300 to Rs 500 a day,” they said. If the government wished to reduce the number of deaths by drowning in canals, it should give us government jobs so that we could maintain a vigil in the area and launch rescue operations as soon as any tragedy struck, they said. “Had we been on such a duty near the canal, we could have saved at least one or two Ludhiana boys who were washed away last week after they met with an accident,” they said. The bodies of two of the three Ludhiana-based boys were fished out from the canal by these divers. “Even yesterday, we saved two men from drowning when their truck went down into the water near Saunda Head in Fatehgarh Sahib,” they said. This survey was also conducted in Ludhiana, Taran Tarn, Ferozepore and Faridkot but Patiala villages were found to be the worst hit. Fluoride, which leads to various diseases related to bones, have long-time effect on people. It leads to deformation of bones. It has been found out that the fluoride has infiltrated to the depth of 60 feet. Therefore the department has come up with a new scheme ‘Nirmal Jal’ which will enable people to get potable water. The tubewells would be further dug as the water at around 90 feet has lesser fluoride. The older schemes will be renewed and in villages where such schemes haven’t reached, this would be started with an investment of around Rs 30 lakh. Sources said the World Bank and the department had joined hands for the fulfillment of this scheme and it would be completed by 2011. The board has been doing its task in a haphazard manner and has dug up almost the entire locality. The monsoons have taken the entire situation to an alarming level, with the people unable to walk or drive on the roads. Another resident Rajinder Singh informed that the board was laying down the pipes without proper consolidation. Superintendent engineer of the board VK Garg said the board was trying its level best to complete the work on time, but the rain had caused some problems. The varsity has decided to invite tenders for the upgradation of the treatment plant. It is pertinent to mention here that this plant was established as a part of the sewarage treatment plant that was established in 1970, with a capacity of 300 MLD. This 40-year old plant is now facing few technical errors as a result of which it often becomes non-functional despite regular maintenance. Therefore, the university authorities have decided to upgrade the system to save potable water. “When the plant was established, the number of varsity residents was very less, but with time, the strength has gone up. Though we repair the plant regularly, but as it is a very old technology, problems do crop up,” he added. Parkash Singh, a farmer of Pabri village, fell unconscious while spraying pesticides in his fields today. He was rushed to the Civil Hospital in Rajpura from where doctors referred him to Government Rajindra Hospital, Patiala. His relatives said he sneezed while spraying the pesticides and inhaled the deadly spray accidentally. They said the farmer was not wearing mask or gloves while spraying pesticides. The State of Punjab’s action of withdrawing the benefit of ad hoc promotion to nine cops has failed to find favour with the Punjab and Haryana High Court. Allowing a petition by Dilbag Singh and others, Justice Ajai Lamba quashed the impugned order after holding it to be “unreasonable and arbitrary”. Justice Lamba added that the order was “in violation of principles of natural justice”, as it was passed “without giving an opportunity of hearing to the petitioners”. The petitioners had sought quashing of order dated April 29, 2008, passed by the Senior Superintendent of Police, Amritsar City. In all, nine constables had approached the court claiming they were initially promoted as head constables due to “exemplary work”, but were later reverted. Their first petition challenging the reversion order dated July 1, 1999, was disposed of by the high court. Apparently dissatisfied, the respondents filed a Special Leave Petition. Justice Lamba asserted: “It is brought out that the respondent state filed an affidavit before the Supreme Court clearly stating one-time relaxation was being given to the petitioners….” “As a consequence of the stand taken by the state before the Supreme Court and the orders passed, required relief was given to the petitioners vide order dated January 23, 2002. Justice Lamba concluded that he was of the considered opinion “benefit of one-time relaxation in regularisation of ad hoc promotions having been given to the petitioners on account of the stand of the respondents taken before the Supreme Court and another order could not have been taken away by subsequent order after about six years, without giving any opportunity of hearing to the petitioners”. Picking up a woman in a car with “ill intentions” has cost a cop dear. Not only has head constable Kulbir Singh suffered “forfeiture of five years of past service” but also the Punjab and Haryana High Court has upheld orders holding that he was “not entitled to pay beyond what he received” during suspension period. “In the meantime, Station House Officer, Civil Lines, Amritsar, reached there and on seeing him, the associates of the petitioner disappeared from the scene. The petitioner was caught with the woman and both were challaned under Section 109 of the CrPC”. Justice Lamba added: “A departmental inquiry was conducted, whereupon the charges stood proved. The punishment imposed by the Senior Superintendent of Police, Amritsar, is forfeiture of five years of past service with permanent effect. “Further punishment is that the petitioner will not be entitled to pay beyond what is received by the petitioner during the period while his services are under suspension”. The order of punishment has been upheld in appeal. “It seems that the petitioner filed a mercy appeal, whereupon the matter was remanded, however, the Inspector-General of Police, border range, Amritsar, on examining the documents, maintained the punishment”. Addressing a press conference here today, Hoshiarpur SSP Rakesh Aggarwal said the victim’s father Surinder Singh of Kitna village had filed a missing persons report of his daughter Kanchan. During investigations, the accused, Mani Partap (20) emerged as the main suspect. He was arrested and during preliminary interrogation revealed that he had killed his sister as he doubted her character. To save the family honour, he had spiked the meal with sleeping pills on June 29 and when the family members became unconscious, he strangulated Kanchan. Later, he wrapped the body in a bed sheet and threw it in a canal. On July 4, an unidentified female body was fished out from the Panshta Nehar in Kapurthala district and the girl’s family was called in to identify it. Partap went to police station and failed to identify the body. The SSP said after Partap's confession, a case has been registered under Sections 302 and 201 of the IPC. In his complaint to the police, Satish Kumar of Ludhiana said he took lift from two unknown persons from Delhi yesterday. They assured to drop him at Ludhiana. Satish was carrying Rs 8,000 cash and some expensive material he had purchased from Delhi. Near Panipat, he was offered a cold drink by the car occupants. After consuming the cold drink, he fell unconscious and when he regained consciousness, he found himself lying by the roadside in Rajpura. The matter was reported at the nearby Shambhu police post. He was taken to the Civil Hospital, Rajpura. Later his relative took him to a hospital in Ambala.